lately i've been on my annual summer cobbler binge. seems i do this every year when the peaches and berries are prolific. 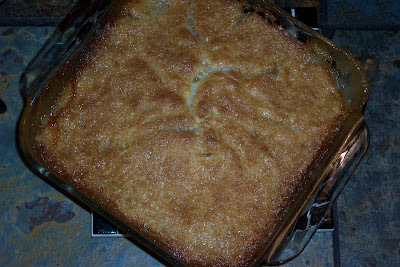 3 blueberry cobblers in as many days and tonight this peach cobbler still sizzling from the oven. fortunately, we had company this past weekend to help us consume the blueberries. not this peach one... hubby and i will have a dish sitting on the steps of the pool with a cup of coffee and then have our nightly refreshing swim. Thanks for these yummy photos. Too bad they don't start with the letter "S"
MMM! MMM! MMM! I can just taste it now! Oh, wait, no I can't!! The visual is only a tempter to cause my saliva to flow without the satisfaction of the yummy in the mouth! Not only do you create our jealousy of your perfected gardening skills, but now you add insult to injury with the indoor gourmet triumphs! Hey, I have an idea! We all would like a personalized tour of your yard to 'see for ourselves', and you could have us bring our swimsuits for a follow-up dessert and dip in your pool! I'll gladly bring the whipped cream! Just say when! SENIORGARDNER WINS PRIZE for best idea the week!!! Count me in! sg: "Hey, I have an idea! We all would like a personalized tour of your yard to 'see for ourselves',"
That just isn't fair. 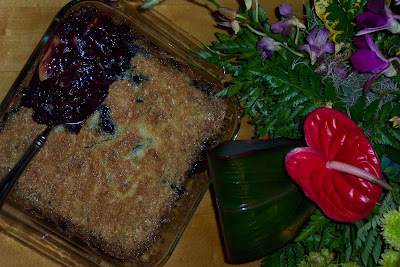 I love cobbler...and yours is the best...Can that be overnighted?? nt: sorry, don't think that can happen but i'll be glad to fix you up with one when you come back for a visit.